The Sox won Game Seven of the 2007 ALCS yesterday by a score of 11-2, to move on to the World Series against the surprise (understatement) of the year, the Colorado Rockies. Dice-K pitched surprisingly well in the win. Jake Westbrook also pitched well, but the bullpen pitched horribly (well, mostly Betancourt). Dice-K went a solid five innings, giving up two runs on only six hits and struck out three. Although there were some moments where you could have been concerned that the Indians would break out for a couple runs, he was able to get out of trouble (finally, he has done that). Then Hideki Okajima (the Okie-Dokie) came in in the sixth and pitched 2+ shutout innings, giving up only three hits. 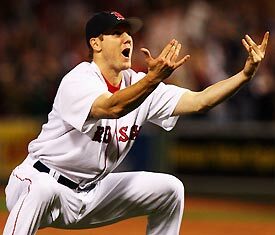 Then, Jonathan Papelbon pitched a one hit eighth and ninth, do get his first career two out save, and a berth in the Series (not to mention a little jig, afterward). They walked nobody, meaning they haven’t walked anyone for two straight games. The Indians pitching staff got a great start from the starter, Jake Westbrook, who went six innings, giving up nine hits and three runs while striking out five. But, then Rafael Betancourt came in. He came in and gave up seven runs (six earned) in only one and two-thirds innings. This is why they lost. Jensen Lewis gave up one run in one and a third innings. The Sox bats came alive for the second straight game. Dustion Pedroia and Kevin Youkilis went three for five, Mike Lowell was two for three, Jason Varitek was three for four (finally he did something) along with a few one for threes. The game was broken open when Dustin Pedroia hit a two run homer in the seventh inning off Betancourt. Youk also chipped in a homer in the eighth. Pedroia had five RBI on the night, Youk had two, and Manny, Lowell and J.D. Drew (finally heating up, alleluia) had on apiece. The Indians bats got a good amount of hits, but they hurt themselves by leaving seven runners on base in the course of the game. Every player had a hit except Victor Martinez (very surprising… he’s done well), who was 0-4 and left two runners on base. They got RBIs from Grady Sizemore and Ryan Garko, who were 1-3 and 1-4, respectively. Okajima really saved us last night. His doible play in the seventh inning was a big turning point. Another was when Kenny Lofton did not score on a double into left field. He was on second and a double was hit into left. He was rounding third and did not score, and this was a HUGE mistake at the time. And, Coco made a nice over the shoulder catch to end the game. This was a nice way to cap off a great defensive year for him (I don’t expect hime to play much in the Series). We are almost spoiled here in Boston, as we all expected them to be able to get this series done. It was never a matter of “if”, but when. This team has worked hard and deserves to be where they are (I know, get on with it, but I can’t say how bad someone did, they did great so I have to put something here). Hopefully they’ll be able to bring home another championship. I actually hope that it snows during the series up in Colorado. Wouldn’t it be great if it started snowing and we won the Series in the snow. We’d see Manny making snow angels (just Manny being Manny), throwing Josh Beckett in the snow and more. Unfortunately, they’d probably call off the game before that happened (darn it, I thought we’d see that…). Anyway, congrats to the Sox. Now, lets take our minds off the thought of snow and back to the weather here in Boston (80 degrees today). As we prepare to begin the World Series, the Sox really helped themselves yesterday. Since Beckett didn’t have to pitch, he’ll be able to in Game One on Wednesday. So, we’ll have the rotation the way it should be for the series. I think this is going to be a quick series. Although the Rockies have that home field advantage (of snow) in games 3-5, I think we’ll win all the games here, and we’ll only have to take a few on the road. This should be a 4-5 game series (at least, I hope, my stress level is only now decreasing). I expect it to be similar to the Series in ’04, quick with some mistakes from the other team (i.e. pitcher getting caught in rundown at third, *coughs* Jeff Suppan *coughs*). I think Josh Beckett is a guaranteed win in Game One Wednesday (even though he goes up against a very underrated Jeff Francis), and Schilling should be able to pick up the win in game two, going against Ubaldo Jimenez (who?). When the series shifts, though, I am worried about D-Mat (as usual…). Luckily, he should be able to get it done, for the Rockies bats have been bad in the playoffs, their pitching has gotten them through the playoffs. As for Wake, his knuckle will dance in the snow in Denver, and the Sox should win the series. The Rockies do have a pretty good offense, though. They have young players like Matt Holliday, Garret Atkins, Kaz Matsui and Troy Tulowitski. Although Atkins and Tulowitski have been slow (combined .182) in the playoffs, you have to be wary they will break out of their slump (they ARE good players…). Although I think we will win in four or five, I am not taking them for granted. I would NOT be surprised if they make it a series, but I don’t expect it. So, we believed in the Sox all the way (so we say, lets face it, did we…?) and they got it done for us. I think they have proven to us they can get it done even when down by a large margin. So, keep believing and… BRING ON THE ROCKIES! By the way: BC ranked number two in BCS standings, play Virginia Tech on Thursday night. This entry was posted on October 22, 2007 at 5:05 pm	and is filed under Curt Schilling, Daisuke Matsuzaka, David Oriz, Jacoby Ellsbury, Josh Beckett, Manny Ramirez, Red Sox, Tim Wakefield, Uncategorized. Tagged: ALCS, baseball, BC Football, Coco Crisp, David Ortiz, Dustin Pedroia, Garret Atkins, Grady Sizemore, Indians, Jacoby Ellsbury, Jake Westbrook, Jeff Francis, Kaz Matsui, Kenny Lofton, Manny Ramirez, Matt Holliday, MLB, Rafael Betancourt, Red Sox, Rockies, sports, Troy Tulowitski, Ubaldo Jimenez, World Series. You can follow any responses to this entry through the RSS 2.0 feed. You can leave a response, or trackback from your own site.